The Sochi Olympic mascots- a snow leopard, a polar bear and a hare – are hoping to earn their place amongst the best-loved symbols of the Winter sports spectacle. Over the years, the Winter Olympics has thrown up plenty of successful and memorable mascots. We’ve had Olympiamandl the Austrian snowman, the Canadian polar bears Hidy and Howdy, the French gnome Magique and Japan’s little owls, the Snowlets. 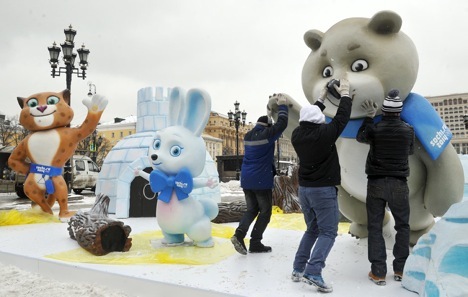 This time round, the three mascots for the Sochi Games – a snow leopard, a polar bear and a hare – are hoping to earn their place amongst the best-loved symbols of the Winter Olympics. In 2008, Russia held a presidential election. In Sochi, however, there was another election taking place at the same time, this one to select an Olympic mascot. The people of the host city for the 2014 Games chose a dolphin on skis, but the city’s views were ignored, and the organizers decided to put the issue to a nationwide vote instead. Curiously, for unspecified reasons, the jury choosing the finalists eliminated the two contenders who had won the qualifying round: a toad called Zoycha and a pair of winter mittens. Interestingly, a few days before the final vote, Father Frost, Russia’s version of Father Christmas, was excluded from the list of contenders. Had he won, this would have meant one of Russia’s national symbols being transferred into the ownership of the International Olympic Committee for a lengthy period of time. The final round of voting took place in early 2011, and was shown on national television, with more than 1.5 million people casting their votes. First place went to the leopard, backed by Russia’s current president, Vladimir Putin. Second came the polar bear, who had won favour with the president at the time, Dmitri Medvedev, and the hare grabbed third. Luchik and Snezhinka, a little ray of light and a snowflake, were chosen as the mascots for the Paralympics. Notably, this was the first time ever that Olympics mascot had been chosen through a public vote. In the past, endorsing official mascots has been the prerogative of organizing committees. To devise Olympic heroes for the 2006 Games in Turin, the organizers invoked the two main states of water used at the Winter Olympics – snow and ice. The result was a lithe and elegant girl called Neve and a strong, direct and focused boy going by the name of Gliz. At the next Winter Games, in the Canadian city of Vancouver, the organizers turned to history for inspiration. The characters they chose were living embodiments of ancient native legends. Quatchi was a reminder of the tale of Bigfoot, a snowman who, according to native Indian legend, inhabits the forests of North America. The second mascot, a small and agile girl called Miga, transported us to the legend of the sea bear, a killer whale who on coming ashore, could adopt the form of a she-bear and roam around towns and villages. The first mascot in the history of the Winter Olympics was a snowman by the name of Olympiamandl. He made his appearance at the thriftiest games ever, in the Austrian city of Innsbruck in 1976. The organizers managed to make all the arrangements within just one year, after the American city of Denver had decided to pull out. Olympiamandl became so popular with spectators that trying to devise a mascot for the Winter Olympics became a tradition. Four years later, the US hosted the games, in the village of Lake Placid. The mascot chosen for them was a raccoon called Roni. What made him special was that he went down in history as the first mascot to become an advertising product. Will Sochi stadiums become white elephants after Olympics? Ahead of the 1984 Games in Sarajevo in Yugoslavia, the organizers arranged the first ever contest to find a design for the Games mascot. Out of 30,000 entries, a wolf-cub called Vucko emerged victorious. One of the most charming mascots in Olympic history, Vucko made his mark with spectators not just because of his cheerful smile, but also on account of his orange scarf, which featured a snowflake. Thanks to sales of the scarves, as well as toys decorated with Olympic symbols, Sarajevo set an Olympic record that is yet to be broken. The mascots for the 1988 Games in Calgary were the polar bears Hidy and Howdy. Legend has it that they were brother and sister, and inseparable to boot. And they wore cowboy outfits, no surprise given that, at the time, Calgary used to play host to an annual festival of country music. Four years later, in Albertville, the mascot was left to its own devices. Initially, the French introduced the world to a gazelle called Chamois. But she failed to win the public’s heart, and, for the first time ever, an Olympic mascot was replaced right before the start of the Games. The new mascot for Albertville-1992 was a gnome by the name of Magique. He was shaped like a star, symbolising the efforts of athletes to scale new heights. The 1994 Games in Lillehammer were the first Winter Olympics not to take place in the same year as a Summer Olympics. It was also the first time that the mascots were people, rather than characters from fairy tales, or animals – the fair-haired brother-and-sister combination of Haakon and Kristin. Toys crafted in their likeness sold by the million, but at all the official ceremonies, the mascots were played by ordinary children, dressed in national costume. When it comes to the sheer number of characters, no-one can match the Japanese. The 1998 Games in Nagano had four mascots. The initial choice, a weasel called Okoi, was replaced by four colourful little owls. Collectively, they were known as the Snowlets. The owl is a symbol of wisdom, and the organizers were keen to highlight the Olympic, sporting wisdom of the Games. Meanwhile, the number four pointed to the four seasons, and also to the four elements: wind, water, fire and earth.